The Govan Census Game takes its inspiration from the ‘Top Trumps’ games that usually pit famous footballers or fast cars against one another. 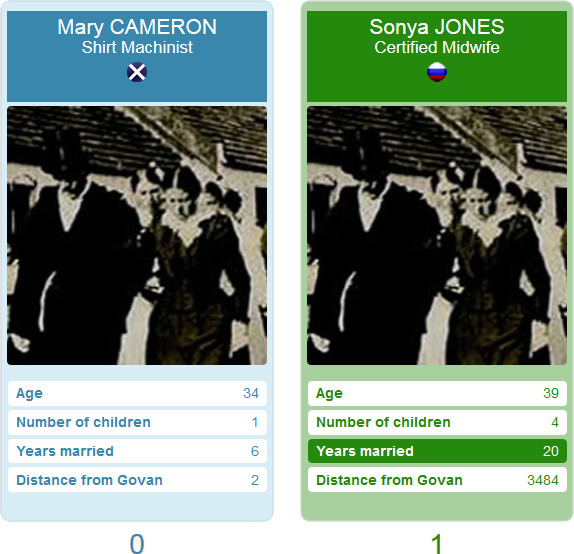 For our game, the data are drawn from real census data that detail the inhabitants of 1911 Govan. Our game cards display four key pieces of information about an inhabitant: their age, the number of children they have, the number of years they’ve been married, and the distance they have travelled to live in Govan. The idea is to click on the statistic you think is most likely to beat that of your computer opponent’s current card. For all four statistics, higher numbers are better. A pair of game cards. The card on the left is your card and the card on the right is being played by the computer. In this instance, you can see that the computer has selected ‘Years married’ as the statistic it wishes to play. For example, if your current card (the one on the left) indicates that the person in question was aged 65, you might guess that the person on your opponent’s card is younger and click on the age statistic on your card to select it. If you win (the person on the computer’s card was younger than 65) your score will increase and you’ll get to choose a statistic from your next card. If the computer wins, their score will increase and it will immediately play its next card. It’ll be your turn again when you can no longer see the computer’s current card (it will be replaced by an empty card with a question mark on it). Your score, and that of the computer, is shown beneath your respective game cards. Some of the inhabitants of Govan in 1911 were born there, or just a few miles away in another part of Glasgow, but many were from much further afield! The inhabitant’s birth nationality is indicated by the flag at the top of the card. This might provide a helpful clue as to the distance they’ve travelled to Govan! While the game uses real census data, we’ve selected only those records that include all of the above information. So you won’t find anyone who isn’t married, for example. If the computer wins a round, it’ll immediately show you the next card it’s going to play.